Blorum.info: A Blorum (ie blog+forum) for Digital Media Marketing Expertise! : Who is legit, who is scamming? We are the department which is in charge of registering Internet intellectual property of Asia. I have something need (sic) to confirm with you. We have received an application formally, one company named "QianKun Investment Limited" applies for The Internet Trademark: Spellingcity. The domain names: spellingcity.cn spellingcity.hk spellingcity.biz spellingcity.info spellingcity.com.cn. On Oct 6.2008. After our initial examination, we found that the internet brand applied for registration are the same as your company's name and trademark.These days we will deal with it, hope to get the affirmation from your company. If your company has not authorized the aforesaid company to register these, Please contact us as soon as possible.In addition, we hereby affirm that our time limit for dissent application is 10 workdays. If your company files no dissent within the time limit,we will unconditionally approve the application submitted by "QianKun Investment Limited.". Best Regards, Brian ----------------- This is a letter for confirmation.If you are not in charge of this please transfer this email to appropriate dept. Thanks for your cooperation. 2. I also recieved a large envelope in the mail this week with this Parents Choice Award certificate and a request for $525 to use the Parents Choice seal on my website. The reason that I only scanned half the form is that I did not (as of yet) pay the $525 to use their logo. I had forgotten that I had applied for a Parents Choice award earlier this year. The award and organization are somewhat prestigious. Despite that, their communication to me about the award almost got thrown in the trash by accident. Bottom line. The "intellectual property" email turns out to be an effort to sell me some domains closely related to mine. Sleezy but not a scam. The award with the $525 offer to buy the sticker is from a nationally recognized prestigious non-profit. Weird. 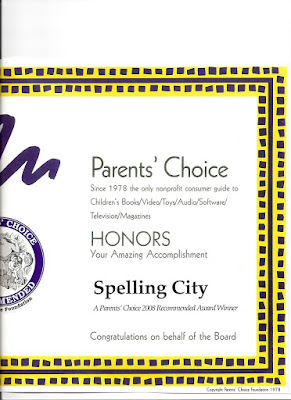 The Parent's Choice awards are awards given by a well-respected long-standing non-profit foundation. Established in 1978, Parents’ Choice is the nation's oldest nonprofit guide to quality children's media and toys. I feel that they are a little clumbsy in their approach to me and a little old-world in their marketing in general. Specifics. 2. Their website could do more to show credibility. For instance, they are a "non-profit foundation" but they don't explain if they are a 501(c) 3 or what. They also don't post a copy of the IRS letter certifying their nonprofit status. They also don't list how to find out more information. They also don't post their Form 990. They also don't list a board of directors. Frankly, this is a lot of information that they are NOT posting. They do list two partners who "deliver Parents' Choice recommendations via the latest technology" with links to Satellite Radio and the TivoKidsZone. 3. Frankly, I'm sympathetic to Parents Choice. They are fighting the good fight for kids much the way that they've been doing for decades struggling along with small budgets. For a toy vendor or software vendor to put $525 out to get an impressive seal on their retail box is very sensible and a good strategy. For a free website to dish out $525 to put a seal on their website....the economics are very different. They probably don't know that I get approached daily to put seals on my website. They probably work with some major newspapers and organizations who know them well and so they don't worry about credibility so they don't think to list their board and documents publicly. They don't think about the unwashed masses showing up at their website trying to figure out who they are and what to do. They don't run a blog, they don't work closely with other major fast-moving children's protection groups (http://www.netfamilynews.org/, http://safekids.com/ , http://www.childnet-int.org/, http://www.commonsensemedia.org/). They probably don't even monitor online posts about themselves. I wonder if I should join get involved, join the board, pay them $525, or otherwise engage and contribute? I wonder if I should write this post as if someone were going to read it? Obviously, I'm being a little critical but being hidden in a little corner of the internet, it's like anybody is actually going to read this, right? Oh, and back to the "intellectual property" email to buy some domains closely related to mine. It's an effort to sell domains dressed up as Intellectual Property protection. I don't feel that it's a scam, I think it's just a "creative" somewhat sleezy sales campaign. You could view it as a service that they have found some domains that they will offer to me to help me protect myself, making a nice profit in the meantime. It's not that different from the way Godaddy suggests that I take these domains when I signed up for other ones. But the pricing is different. Of course, you could see it as one step from blackmail in that they've taken domains which might get confused with mine and are suggesting that I buy them at ten times their cost or let some foreign group go imitate me with closely related names.